I’m going to go to the doctor in a couple of weeks, not because I’m sick, or even for a checkup, but to deal with my ‘family history’. A lot of people who know me would think that means I’m going to a psychiatrist. Yeah, my family was/is pretty crazy, at least on my mother’s side, but most of those people are dead now. There was my Aunt Mabel, who talked to her toaster; my Great Uncle Irving, who was so depressed that the only thing anyone remembers about him is that his favorite saying was ‘don’t worry, nothing will be alright’; my grandmother who, at 90, with no significant physical ailments, decided she was just done, and ‘took to her bed’, ringing a bell for the servants when she wanted something, randomly firing her caretakers and then demanding that they stay, and generally terrorizing anyone she could from her place under her blankets. But no, despite the fact that I was scarred for life by all the bizarre behavior in my family, I am not going to see a psychotherapist this time. I am going to a Preventive Cardiologist, because I would like to live longer than either of my parents did. My father, a true intellectual and also a savvy businessman, died at 75 of a conglomeration of cardiac and neurological problems. He had coronary artery disease at a young age, and had a triple bypass at 60. He was never quite the same emotionally or cognitively after the bypass surgery; at that time people were just becoming aware of the negative effects of being placed on cardiopulmonary bypass during the surgery, and I think his decline after that was a combination of those effects and depression from loss of youth and health, and from taking early retirement from his very stressful job, something that in theory should have been good for him, but in practice, killed his spirit. My mother had a sadder story. She died way before my father, at 62. She was seemingly healthy, other than some high blood pressure. She woke up one morning, looked at my father, and said, ‘call 911, I’m dying.’ And then she did. We never found out the exact cause of her death. Somehow, despite the rather odd circumstances, my father, raised an Orthodox Jew, talked the coroner out of doing an autopsy. So she could have died from a massive heart attack or a massive stroke. Either way, some catastrophic vascular event occurred. A lot of people in my father’s family had cardiac or vascular problems. My father knew his cholesterol was high, but there were few medications for such a thing then. He didn’t pay much attention to his diet until after the coronary surgery, and he was sedentary all his life. Exercise wasn’t even on his radar screen. My mother, on the other hand, came from a family with great longevity- her parents lived well into their 90’s as did her aunts and uncles. I know for a fact that her father, my grandfather, ate scrambled eggs and charred toast every morning, smoked cigarettes when he was young and then a pipe later, and ate ice cream every night. Still, he lived a very long, very healthy life. My mother’s blood pressure control was questionable, but she had no cholesterol problems, quit smoking in her late 20’s and, unlike most of the women of her cohort, exercised regularly. My brother, 20 months older than me, has high blood pressure and high cholesterol, despite the fact that he is not overweight. He is on medication for both and seems to be fine, but he is only 52. So I turned 50, and started thinking that it was time to address my risk for heart disease and stroke. Like my mother, I have migraine headaches. There is a correlation between ‘classic migraine’, the kind of migraine that is accompanied by flashing lights or other neurological phenomenon, and heart disease. But I have ‘common migraine’- I just get the headache, and there’s no proof that common migraines are associated with heart disease. Still, migraine in general can be related to stroke. Unlike my mother, my blood pressure is quite low. Up until fairly recently, my cholesterol was fine, but it’s slid into the abnormal range over the last couple years, despite my normal weight, regular exercise, and usually careful diet. I look more like my father’s side of the family (the heart disease side) than my mother’s side. Of course, as most doctors would be, I am tempted to assess and treat myself. I did start a baby aspirin a day, despite lack of hard evidence that it prevents cardiac events in women. But I figured it was pretty harmless, so I went ahead. I upped my exercise a little. But then I had some funny chest pain while exercising, which made me nervous. My assessment, and my husband’s, was that it was muscular, because I could press on my chest and make it hurt. But we probably shouldn’t be the ones to decide that for sure. I’m not sure what to do about my cholesterol. The data on treating levels like mine is all over the place, and depends on all the other risks a person has. I don’t want to take powerful medicines that may have side effects if I don’t need them. But I also don’t like having untreated high cholesterol with my family history. So, I will make a trip to a specialist- someone who makes these decisions for their patients all the time. It’s the right thing to do. I may be able to accurately assess the risk of my patients, but I’m having trouble with my own because I lack objectivity. Completely. Still, part of me feels like this doctor visit is very neurotic. After all, I’m fine, and there is an awful lot of over-testing and over-treatment that goes on in the prevention world. Yes, I’m a skeptic, after all. Despite the fact that I prescribe all kinds of tests and medication, I am all too aware that not every situation requires intervention, and I am against overly-aggressive medical care. It’s all a judgment call, and I will have to trust my doctor’s judgment. I have to remember this: If I don’t take care of myself, I am a bad example to my patients. I’m no good to anyone if I am not healthy. So this time, I will bite the bullet and put myself in someone else’s hands. Hopefully the adage ‘an ounce of prevention is worth a pound of cure’ will apply this time. I am just returning from my vacation, where I finished reading your book. Thank you for writing such a poinant and honest account about hep c. I am a nurse and I have worked in Internal Medicine. Your story touched me on so many levels. I have worked in a practice where many physicians sought there primary care (Penn). I have always made a point of treating doctors as patients when they call. I like to think that if I was the nurse at the practice where you received your first treatment, that the bruised thighs would have been avoided altogether. You clearly did not receive the support you surely needed. 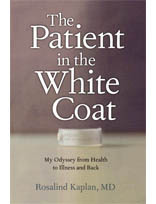 As a result of reading your book, I will continue to treat physicians as patients, with the dignity and respect that I feel all of us are entitled. Nurses make jokes that if we are admitted to the hospital, we don’t disclose our occupations. We say that if we do so, they have us making our own beds on post op day 1. (not really a stretch) I also was deeply touched by your courage. You are a brave lady! I do not have hep c. But my husband, Timmy had it and was diagnosed around the same time as you. Maybe a little earlier, because at the time they called it hepatitis non a non b. He received the Rebetron treatment and initially responded, but unfortunately late in the course, his hemoglobin dropped and they needed to titrate the ribaviron and in week 44 of the treatment, his virus returned. It was devastating. The treatment was stopped. He suffered severe complications of Rheumatoid arthritis during the treatment that left him completely disabled and also ungodly ill. He did eventually recover, but was not not able to be treated again. He later developed multifocal HCC and he died in April 2009. He was 51 years old. He was never so sick as when he was on the rebetron. I truly got the whole piece of the married couple fighting the illness “together”. You told the story with such truth. It did make us stronger and when he was terminally ill, we were able to stand up together and love each other as we always had and face it as a couple. I know that I will miss him forever. But I also have a deep sense of peace for first of all just knowing my husband and also for the beautiful way his life ended. He died in our home while I was holding him in my arms. We were surrounded by our friends and family. I also have always had a deep disdain for the few, especially in our own profession who would ask “how did you get this virus?” I understood when they were assessing risk factors, but there were also times when you could have cut the prejudice in the room with a knife. (we actually fired an NP once and insisted on being followed by someone else) I first developed this disdain years before with the onset of hiv/aids. I always felt it didn’t much matter how a person got the virus, if they got it, they got it. I could always count on it being complicated, especially if an individual was still addicted. I am so happy you addressed that in your story. It still really needs to be said. Again, I thank you so much for telling your story. You are funny and honest and most of all you are brave!! I wish you much happiness and health. May God continue to bless you and keep you! Was intrigued by the concept of going to a Preventive Cardiologist, but dismayed that you are fragmenting your care among specialists, rather than adhering to the premise of non fragmentation and using your PRIMARY CARE MD as your fulcrum, and being refered only by the necessity of especially expertise. The entire premise of GOOD medical care , I suggest, should be based on care being rendered by the Proimary Care person, and specialized opinions or care be rendered by referral only. My primary care doctor is sending me to the cardiologist. I agree with you that non-fragmentation of care is the best way to go, but the primary care doc isn’t sure she knows the right answer, either. Risk assessment can sometimes be very tricky, especially when some of the risks are unkown (like what happened to my mother…). Despite the fact that primary care should be the first stop, there are reasons why specialists exist.